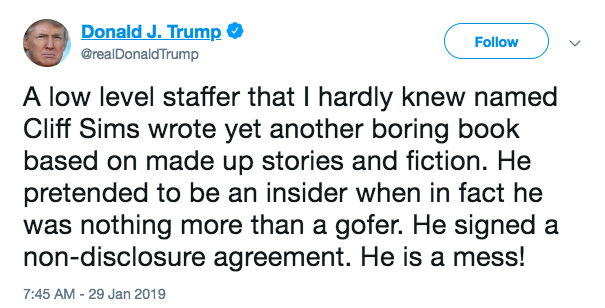 He made an empty threat at the latest former employee to write a tell-all book about his administration. Trump aide Cliff Sims' book Team of Vipers is out this week. Like other books written by Trump's former insiders, including Omarosa Manigault Newman and Chris Christie, it paints a picture of a dysfunctional White House populated by incompetents, self-promoters, and backstabbers, competing to manipulate Trump for their own ends. Trump responded with a curious threat over Twitter. 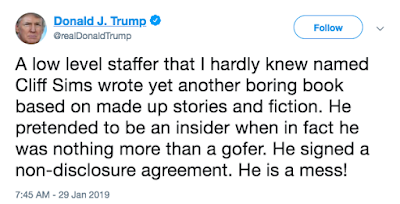 Incidentally, by suggesting that the NDA would apply here, Trump seems to be admitting that the "made up stories and fiction" are actually true. As for Trump's relationship with the "low level gofer" that he "hardly knew," Sims spent much of the day promoting the book by gleefully providing evidence to the contrary. It's not uncommon for Trump to suddenly develop amnesia about people who turn on him, something that happens fairly frequently. Presidents are subject to the laws and the Constitution. It's bad if lots and lots of people leave the White House with stories to tell about how badly it's run. Inability to control self-defeating impulses isn't a sign of good mental health.